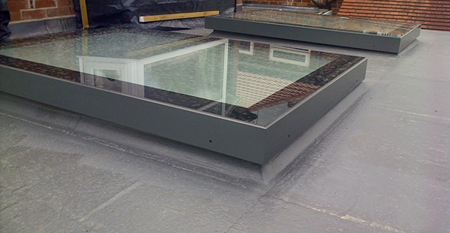 Flat roofing in Taunton is becoming much more popular due to the lower costs compared to a traditional pitched roof. Historically, asphalt flat roofing was only recommended in areas with lower rainfall, but due to enhancements that have come with modern UPVC drainage systems, and the lower cost of asphalt flat roofing compared to traditional pitched roofs, its usage is becoming increasingly popular. 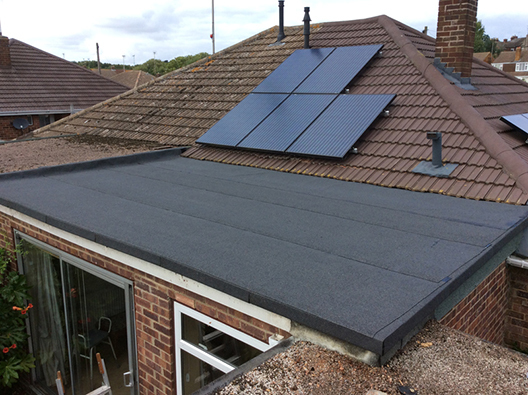 We offer flat roof installations in 3 different colours to compliment your home, garage, or any building that needs a cost effective, durable solution. Our Asphalt Flat Roofs come with a 10 year guaratee. Looking for a 25 year guarantee? Please see our GRP Fibreglass Roof Installation section. Whether your existing flat roof is felt, fibreglass or asphalt, we will make sure that your new replacement roof will be installed to the highest standards of quality and workmanship. Contact Your Local Taunton, Somerset, Devon & Bridgwater Roofing Services & Felt Flat Roof Installation Roofing Contractors NOW for a free quote!